Outside the U.S., Persecution of Christians Is Real, As Sri Lanka Bombings ShowIn an increasing number of countries, particularly in Asia, Christians face challenges a lot more stressful than “Happy Holidays” greetings. 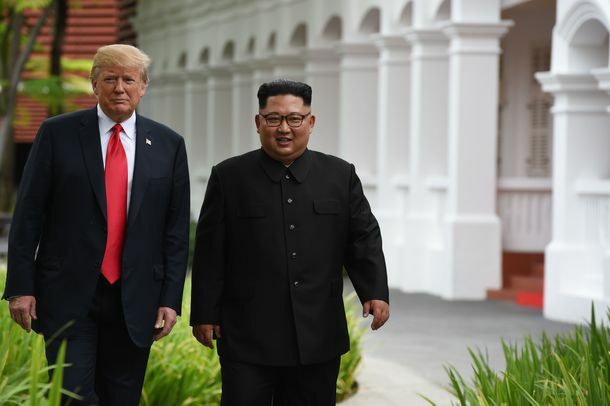 Trump No Longer Demands North Korea Be Held Accountable for Its Nuclear ProgramThe president will reportedly drop plans to seek a full accounting of Pyongyang’s nuclear programs, meaning the Trump-Kim summit could be another dud. Putin Told Trump North Korea Couldn’t Launch Missiles, and He Believed ItHarrowing evidence Trump’s insane credulity on North Korea is influenced by Russia. U.S. Intel Chief Disputes Trump on North Korea and ISISKim Jong-un isn’t giving up his nukes and ISIS isn’t defeated, Dan Coats said Tuesday. Trump Says Secret to Fake Peace With North Korea Was Real LoveIf admiring the world’s authoritarians is wrong, they need only send Trump a “beautiful letter” to remind him he doesn’t want to be right. Donald Trump Is Going to Try a Tricky Balancing Act at the United NationsTrump wants to mount a defense of American sovereignty to please his base while selling allies on shared sacrifice. Pompeo Sets January 2021 Deadline for North Korea DenuclearizationGood luck with that. Lindsay Graham’s Latest Mission: Encouraging Trump’s Blood LustOnce part of the jolly, bipartisan Three Amigos, Graham is now very focused on feeding Trump’s most hawkish impulses. 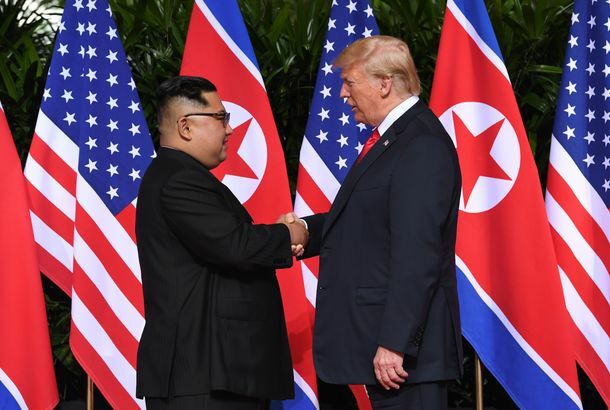 Kim Declares His ‘Faith’ in Trump, Who Offers an Enthusiastic ThanksNorth Korean denuclearization seems stalled, but at least these two are getting along. Trump Just Admitted That North Korea Isn’t Actually DenuclearizingThe president called off Mike Pompeo’s trip to North Korea, citing a lack of progress on denuclearization. U.N. Watchdog: North Korea Hasn’t Stopped Making NukesBut…but Trump said we didn’t have to worry about this anymore! Trump Heaps Praise on Kim, Can’t Wait to See Him ‘Soon’Despite questions over the American remains North Korea has sent back to the U.S., Trump couldn’t be happier with Kim. Trump’s Boast About Getting Fallen Heroes From Korea Is CollapsingKim Jong-un isn’t denuclearizing, and he also isn’t returning the bodies of 200 U.S. servicemen. Other than that, it’s a great deal. Trump Still Pretending Fake North Korea Nuclear Deal Is RealProbably better than getting mad and starting a war, though. Sheldon Adelson’s Fantasizing About Building Casinos in North KoreaThe billionaire casino mogul and Republican megadonor seems to be eyeing expansion in the world’s most isolated country. North Korea Calls U.S. Diplomatic Posture ‘Regrettable’It turns out that getting the country to discard its nukes probably won’t be so easy — shocking no one who has been paying attention. Mike Pompeo Will Give Kim Jong-un Elton John’s ‘Rocket Man’ on CDIn their first meeting, the North Korean dictator told Trump he hadn’t heard the song that inspired Trump’s nickname for Kim. Still No Clarity From White House on North Korea PlanBut at least we’re not at war yet. North Korea May Have Ramped Up Nuclear ProductionKim Jong-un is working to covertly expand his nuclear arsenal, according to an assessment leaked by U.S. intelligence officials. Trump Compares His Propaganda to North Korea’s at Bizarre South Carolina RallyTrump‘s Kim Jong-un envy is a real thing. Trump Thought North Korea’s State TV Was Even Better Than Fox: ReportIt seems Kim taught Trump a lot about the benefits of dictatorship. Pompeo Tries to Clean Up Trump’s Messy Claims About North Korea SummitWhile the president was hazy on timeframes, Pompeo offered a clearer (yet unrealistic) aim: “major disarmament” by the end of Trump’s first term. Trump and Kim Stir Confusion About What They Actually Agreed ToNorth Korean media claims Trump agreed to lifting sanctions and “step-by-step” denuclearization. That’s not what the president said. Everything That Happened at the Trump-Kim MeetingFeaturing historic handshakes, a tour of the presidential limo, and a teary Dennis Rodman — but no detailed commitments on denuclearization. 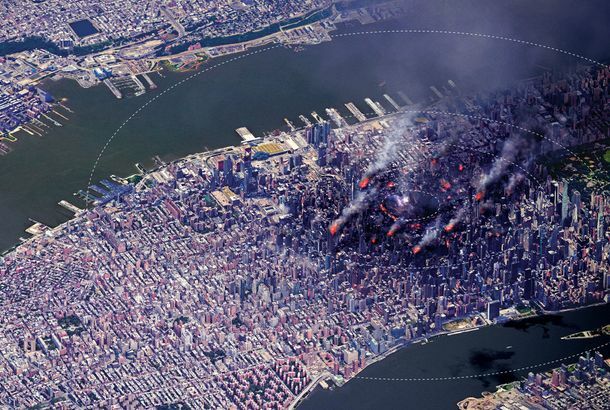 This Is What a Nuclear Attack in New York City Would Look LikeIf America is attacked, the strike probably won’t come from North Korea. And it will be even scarier than we imagine. The Winners and Losers of President Trump’s Meeting With Kim Jong-unBoth Trump and Kim benefitted personally, but diplomatic norms, and everything they’re meant to protect, took a hit. 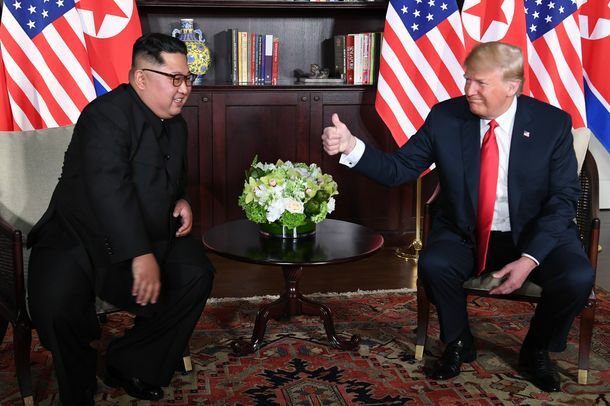 The Trump-Kim Summit Was a Great Photo Op, and Maybe Nothing MoreThe meeting in Singapore fulfilled both men’s desires for respect and media attention, but the actual work lies ahead. Trump Will Leave Summit With North Korea EarlyThe White House says the talks are moving more quickly than expected. But there’s reason to suspect they aren’t moving anywhere at all. On Eve of North Korea Summit, Trump Shows He’s Focused … on Trudeau FeudShortly before his first meetings in Singapore on Monday, Trump was still unloading about trade on Twitter. Dennis Rodman Is Going to Singapore to Shill for a Marijuana CryptocurrencyThe NBA legend and Kim’s “friend for life” is being sent to Singapore by a cryptocurrency for pot.